For buildings designed to have a high performing envelope, another area of concern is for lighter load applications where Fabreeka-TIM® structural thermal break may be excessive. Thermal bridging or energy flow paths through highly conductive building components are considered in the envelope design of many different building types. Ultimately there is a need for a lighter load thermal breaks to prevent thermal bridging and improve energy efficiency when incorporating sustainable elements into your building envelope. Fabreeka-TIM® LT15 material and Fabreeka-TIM® LT5 material provide better thermal insulation than vinyl and plastics, reduce corrosion between dissimilar metal elements, and both are made from recycled materials, which help to achieve LEED credits. 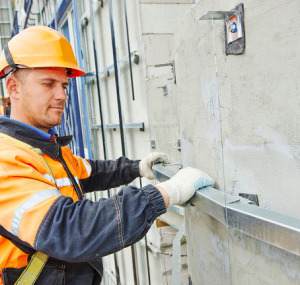 Applications range from facade support brackets and clips to metal building framing to certain concrete and precast connections. For these types of lighter load applications, the Fabreeka-TIM® LT Series thermal breaks have been developed to provide the most energy savings and the best return on investment. For structural connections, please refer to Fabreeka-TIM structural thermal break. Can I use the Fabreeka-TIM LT Series in a structural or moment connection? No the Fabreeka-TIM LT Series is designed for light load conditions. For structural connections, please refer to Fabreeka-TIM structural thermal break information.